What happened? Why this war declared in Russia against tomatoes from Italy and Spain, cheese from France, apples from Poland, and salmon from Norway? Well, what happened that on August 6th President Vladimir Putin signed a decree to destroy all sanctioned foodstuffs imported illegally. Sure – illegally imported stuff comes with no quality check and consumer’s belly will bear the brunt! However, the question remains: why is it illegal to take European foodstuff to Russia? The answer: because President Vladimir Putin joined European sanctions against Russia. Verily, the USA and the EU imposed sanctions on Russian technology and products potentially used in military activity by Ukraine’s pro-Russia separatists. To counter that, however, Vladimir Putin banned Russians from eating European fruit and meat. Well, so be it. He’s the boss. But why bulldoze sausage and nectarines? The sanctions were imposed as early as last year and during all that time European foodstuffs passed nicely to Russia via Belarus and Kazakhstan, and were sold all over the land. Why did Kremlin get so mad so suddenly, even ordering a special crematorium to burn Bavarian sausage and Iberian ham in? Of this, I have three versions. Calling to mind classic Soviet cinema – «Kidnapping, Caucasian Style», where the hero Yuri Nikulin, yawning contentedly, is calculating how many bottles of wine and barbecue the snatched bride threw in the ravine, while empty bottles lay around and barbeque is still in his teeth. 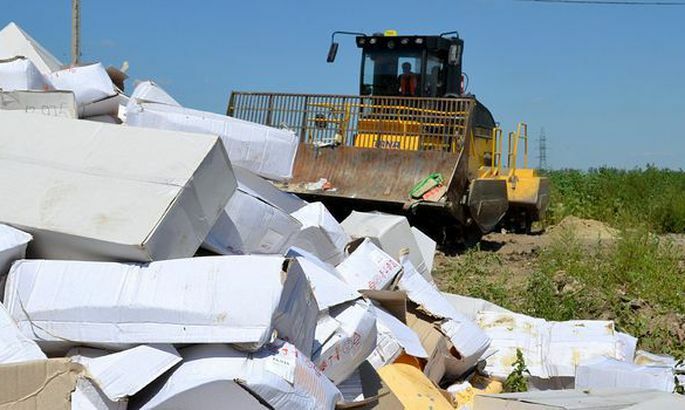 Thus, I think one tonne of Parmesan destroyed near Saratov equals five tonnes of Roquefort cheese heroically saved by Russian customs officials from Rospotrebnadzor and the police. Saved and sent to merchants who sold it on masked as Russian or Belarusian cheese. On paper, however, six tonnes of cheese were destroyed. Now, it was announced by Russia that the market abounds with nectarines from China which are very much like these from Greece and were just recently destroyed near St Petersburg under the watchful glare of video cameras. But who counted the amount? Documents say it was a tonne, but in reality it was 100 kilograms. And if all of a sudden, a year after the Russia-Europe food war begun, customs officials and policemen buy real estate in United Arabian Emirates, no-one will wonder – seeing that for the destruction of banned food, the state has offered rewards. Destroying food in Russia is a symbol of a new faith. The apostle of the strong faith is Vladimir Putin. In pagan cultures, the tradition was to humiliate the bodies of slaughtered enemies and it was carried over into Christianity while even Communists waived not the custom. It was of assistance to authorities, uniting the nation against the common enemy they could spit in the face. Therefore, Stalin held public trials over his foes. These are not peaches trampled near St Petersburg, but the European values threatening Vladimir Putin. The values which are not allowing Kremlin to split Europe. Russia cannot set fire on Brussels, but German pork burns bright and warns the soul. Looks like in the heat thereof, the minds of Kremlin’s strategists have overheated a bit. Something is rotten in the Russian empire. For the first time in 15 years, the people have unanimously supported the actions of the government and yet fail to okay the destruction of food. Russians and food have a special relationship. We have never had enough to eat. According to recent polls, the people are not satisfied with the governmental fight against food. For Russians, bread is sacred even if it is foreign. Even so, looks like the Russian authorities are intentionally aggravating the people. For 15 years, the Putin government has lived on oil and national emotions and what counts is that the emotions remain stirred. By emotions, they supported the destruction of Khodorkovsky’s Yukos, the war in Chechnya, the Sochi Olympics, and the occupation of Crimea. Kremlin’s victory is a victory of the people. Victory, however, is for the Russians a word as sacred as bread. But alas! The Kremlin has no new victories on the horizon: the economy is in decline, the elated mood related to annexation of Crimea is fizzling out. Therefore, a new loaded emotion is needed and that would be famine. This is something that many generations have experienced, and remembered. Even I remember how Granny kindly put manna in my tea as in the Soviet Union of the 1960ies had no sugar in the shops. Likewise, the food crisis of 1988–1990 is well remembered. The clips of food destroyed, shown on Russian TV, are thus terrible – they’re killing bread! Subconsciously, what is created is fear. The shelves in Russian stores have less to offer, the prices are going up, the farmers are not supported. It all points to the government trying to artificially create food shortage in the land. It will not happen immediately. It will take a year, perhaps, but during the entire year the public discontent will grow. And then the Russian TV personalities Dmitri Kisselyov, Vladimir Solvyov, Aleksandr Gordon and others are able to explain to the people that it’s the fault of pindos and European pigs. They’ll be able to explain how exactly the West is attempting to get the great Russia on its knees, and smother the Russians by hunger. As the Russians’ anger rises to explosive levels, it will not burn against the Kremlin. As one, the masses aroused will go to battle against the enemy of the great fatherland. Meaning, the enemies of Putin. The goal is great, and if the path to it leads through Parmesan, then the Parmesan needs to die. And, in a year, the slogan «kill the cheese» will spell «kill the French». 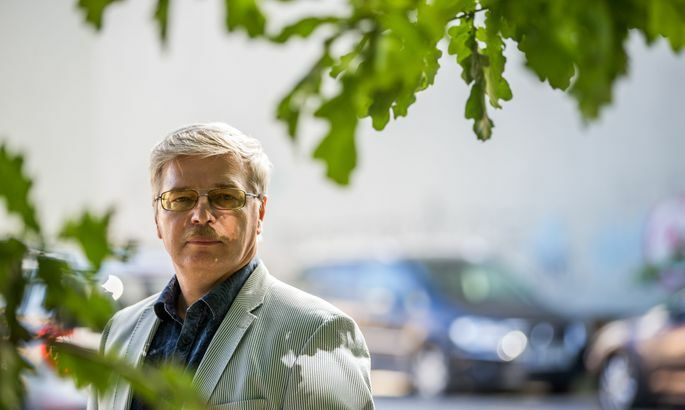 A former Russian state official the author has been granted political asylum in Estonia. For ten years he operated as communication manager at Tomsk Oblast government, followed by six years as head of culture department. Possessing a Master’s in biology and international relations, he currently teaches Russian in Tallinn.